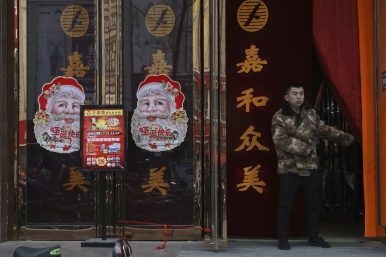 In this Saturday, Dec. 22, 2018, photo, a worker guards the entrance of a shop decorated with images of Santa Claus in Zhangjiakou in northern China's Hebei province. Santa gets pushed out as China’s leaders emphasize tradition. It took less than 24 hours for all the Christmas trees, lights and bells to disappear from a 27-story shopping and office complex in the Chinese city of Nanyang. In Nanyang, about 950 kilometers (600 miles) west of Shanghai, government officials stopped by the office and shopping complex on December 16 to say that Christmas decorations would have to come down, said Ma, the tutoring company employee. Nine hours by car south, Hengyang, a city in Hunan province, said in a December 19 notice posted on an official government social media account that anyone caught holding Christmas sales or celebrations that blocked the streets would be punished. Communist Party members, the notice said, should avoid foreign festivals and instead be “models of adherence to Chinese traditional culture.” Hengyang police posted a video on their official social media account of locals discussing the importance of Chinese culture and plans to avoid ostentatious Christmas celebrations. Shop windows were to be stripped of Christmas stickers and streets kept free of Christmas banners and lights. Law enforcement patrols were to be stepped up December 23-25 to prevent illegal signs of celebration. Some 270 kilometers (167 miles) west, Fuping county, also in Hebei province, issued a similar clean-up notice. Though the December 21 announcement mentions Christmas eleven times, an official from the Fuping urban management bureau said the rules were aimed at street vendors generally, not Christmas. The students came up with a solution: By replacing “Christmas” with “New Year’s” in their activity proposal and changing the date from December 25, it sailed past school administrators. By Erika Kinetz for the Associated Press, AP researcher Chen Si contributed to this report from Shanghai.